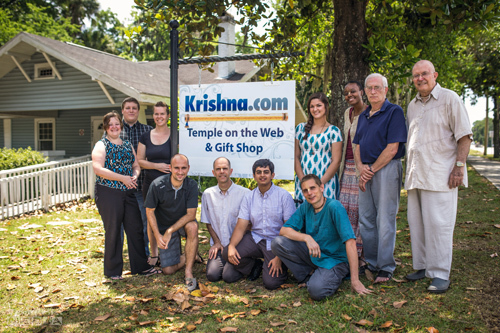 Click on the donate button to support Krishna.com. You can also give a recurring monthly donation below. About our choice of numbers, 108 is auspicious in relation to Lord Krishna, so we're using multiples or divisors thereof. For example, donating $9 per month amounts to $108 per year. Giving $18 a month is two times $108 a year... you get the idea. If there's a custom amount you'd like to give each month, please contact us. Support the Servers! Krishna.com runs on five web servers at a cost of $979 per month: the database server, file server, store server and two email servers. Your donations help offset this cost and keep Krishna.com alive and vibrant. Please use the "donate" button at the top of this page to contribute, or become a patron by giving a monthly donation. Building Renovations Help us complete the Krishna.com building renovations. We've already renovated the warehouse, gift shop, customer service area, and upstairs office. We're in the process of renovating the downstairs office, "florida room" porch extension, and the floors in our hallway and customer service office. The remaining renovations will cost around $17,000. Here's a video of what our building looked like before we began renovations. Helping more than 5200 visitors a day from over 225 countries and territories around the world discover Krishna — priceless! For questions or comments you can contact us at any time via our feedback form and one of our volunteers will get back to you. Please include a note with your check to let us know it's a donation. Thank you for your support. “My first encounter with Krishna.com was as a 13-year-old doing a research project on the Hare Krishna movement. At that point I hadn’t had any exposure to Eastern culture, but I had heard of the Hare Krishnas through their association with George Harrison. An Internet search quickly brought me to Krishna.com, where not only did I find a wealth of knowledge but also helpful devotees in forums and live chat who were extremely willing to answer my questions and served as inspiration for my ensuing personal journey into Krishna consciousness. PS: I have been a devotee ever since, as a young supermarket manager with Asda (Wal-Mart), 30 years ago, I went to remove some 'nuisance' Hare Krishnas from the car park. I ended up buying the 'Goddess of Fortune' album, The Science of Self Realization, and the 10th Canto of the Srimad Bhagavatam, and for me the rest is history! “I first read the Bhagavad-gita six months ago, and it completely enlightened me and answered all of the questions that I have ever had throughout my life. I feel that everyone needs to experience Krishna consciousness and without it there is no possibility of true happiness. So I felt it my duty to Krishna to give and help Krishna.com to spread the word and help enlighten as many people as possible. Krishna Consciousness is the most valuable thing in the world, and I would never trade it for anything. I am trying my best to enlighten anyone around me and it is spreading like fire.